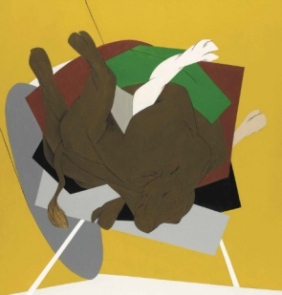 Renowned artist Tyeb Mehta's untitled canvas depicting a falling bull on Thursday got sold for a whopping Rs 15 crore at the second edition of Indian art auction held by the Christie's in Mumbai. The Mehta canvas, dating back to 1999, for which the Christie's was expecting a maximum price of Rs 12 crore, got picked up through an online bid from New York. The identity of the buyer was not revealed. The auction began at 7 pm at the Taj Mahal Hotel. Bidding started at Rs 5 crore and the price kept going up till it reached Rs 14 crore when calls with overseas buyers resulted in longish pauses, before the final bid was made. The amount paid for the Mehta work is hammer price and excludes buyer's premium and applicable taxes. The Switzerland-based Christie's conducted its first India art auction on December 19 last year, when it sold a work by the late Vasudeo Gaitonde for a record Rs 28 crore, the biggest price ever paid for an Indian painter's work. Rabindranath Tagore's pocket book in Bengali having 270 leaves of manuscript notes, poems, songs, calculations, doodles and drawings fetched Rs 1.7 crore at the auction. Other works like Gaitonde's untitled work painted in 1998 were snapped up for Rs 5.5 crore.